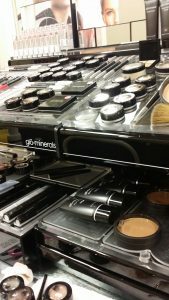 Bridal makeup with Glominerals has arrived! Bridal makeup and bridal trial updo’s are essential on the to-do list for brides-to-be. We recommend at minimum two weeks prior to your wedding for the best test. Meet Cindy Cake one of my brides-to-be. When we spoke on the phone a few months ago, I was amazed at how organized she is, how incredibly specific on what she wanted for her hair and bridal makeup. We met, we planned out her year for all of her appointments that coordinated with her Bridal package that we customized just for her and her bridal party. We understand how stressful getting those to-do lists done! We had already been in the process of updating her highlights for her bridal updo, we updated her base hair color which is now gorgeous and we just did her new bridal makeup with Glominerals mineral makeup. I loved the experience with Cindy because she brought pictures that were helpful to get ideas on what she was looking for as an end result. 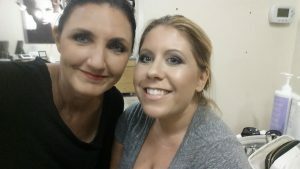 We had spent about 1.5 working through color choices, where we would have certain eye shadow colors, lipstick, lipliners, blushes and her favorite was Gleam finish that gave her a mystical feel. Book here for your makeover! Cindy LOVES makeup and knew what worked for her. At her appointment we really experimened with textures of foundation from satin to sheer to full out coverage. We used the Glominerals Luxe diamond technology foundation that feels weightless and soft. The line has 8 different shades to choose from in the Luxe foundation selection. the Luxe foundation is fluid, has vitamins A, B and other anti-aging elements to it. Try applying with a sponge, fingers or one of our NEW Luxe foundation brushes to create a flawless look. We won’t tell all of her secrets to looking fabulous but will give you the updates as we get closer to her date September 24th! Located at our South George Street location here, you can pick up this brush $36 along with testing out some of our new ominerals Luxe foundation. Call 717846.4424 for a new look. Book here for your very own makeover.